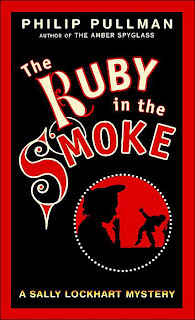 I finished The Ruby in the Smoke by Phillip Pullman this morning. Counts for the YA Challenge, Yipee! It's a fun Victorian mystery. Sally Lockhart is sixteen and her father has died. His ship sank on a trip back from India but Sally has just received a letter that must have come from him just before he sailed. When she goes to her father's company and asks about the letter's contents, the man she asks has a heart attack from shock! Sally gets pulled into a mystery that at first she doesn't understand. Sally is a plucky, independent heroine. I liked reading about her and the friends she makes. I'll be picking up the next book in the series soon. a 6 from me. Man, I've got to get around to this book! I love this cover art.